• We give you 100% of our time, attention and expertise. • We take full responsibility for your satisfaction. • Keeping your best interests in mind is most important. 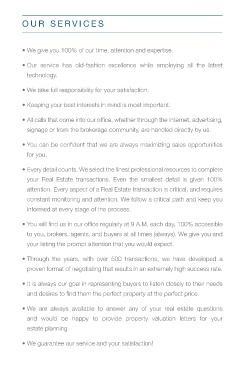 signage or from the brokerage community, are handled directly by us. informed at every stage of the process. your listing the prompt attention that you would expect. proven format of negotiating that results in an extremely high success rate. and desires to find them the perfect property at the perfect price. •  We guarantee our service and your satisfaction!